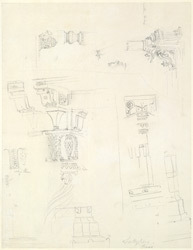 Pencil drawing of architectural details from Fatehpur Sikri, by Thomas and William Daniell, from a set of 16 drawings of architectural details in North India made between 1786 and 1792. Built during the second half of the 16th century by the Emperor Akbar, Fatehpur Sikri (the City of Victory) was the capital of the Mughal Empire for only some 10 years. The magnificent new city with its monuments built in red sandstone was a result of the fusion of Persian and Indian architecture and decorative forms. During the seven years spent sketching in India, from 1786 to 1793, Thomas and William Daniell produced a large collection of working drawings that they later used for their aquatints and oil paintings. On their first tour in North India of 1788 to 1791, the artists set up from Calcutta and proceeded up the Ganges by budgerow visiting all the well-known places such as Bhagalpur, Patna, Ghazipur, Benares and Allahabad. From Cownpore they proceded by palanquin to Agra, Mathura and Delhi and visited the pilgrimage place of Hardwar. They were the first Europeans to reach the Himalayas. They returned through Rampur, Bareilly, Shahjehanpur and Lucknow and proceded by boat to Benares. After reaching Patna they returned to Calcutta by budgerow. Their arduous journeys are recorded in the pencil sketches and wash drawings that they made almost every day.